Global Voices community members at the Global Voices Summit in Cebu, Philippines. The image is a screen grab from a video by Global Voices and PR Works. Our strength lies in our community. Make a difference in the global conversation by joining our team as a volunteer author or translator. 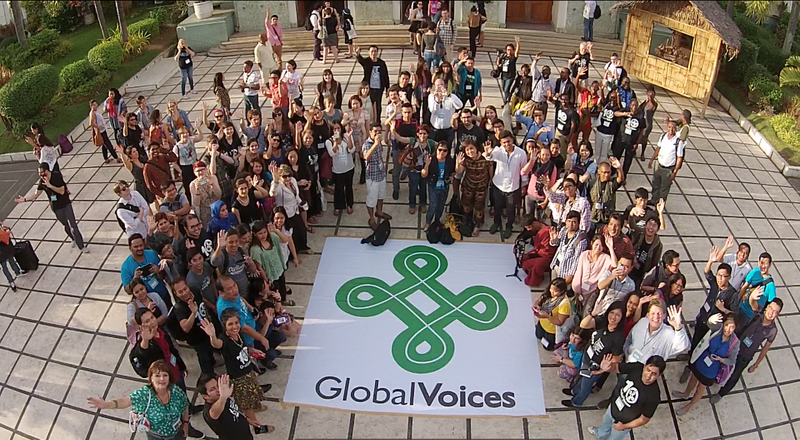 If you are an organization, consider joining Global Voices as a partner. We have hundreds of volunteer authors covering more than 160 countries around the world. Are you a keen analyst of social media, independent media or blogs about a region that is largely ignored or misrepresented by traditional media? Please apply to join our volunteer team of writers by filling out this form. Our stories are translated into tens of languages!. Come and join our prestigious international team of translators and fill out this form! Since 2004, we have partnered with dozens of organizations to amplify the global conversation. Some of our current partners include The Guardian, PRI.org, Deutsche Welle, Slate, La Stampa, Meedan, 350.org, Witness, and Syria Deeply. In the past, we have collaborated with the BBC, Reuters and The Economist. More here. How to Write for GV: An explanation of best practices for writing and reporting a GV story. This includes aspects of effective news writing and explains our ideal story structure with advice on crafting share-worthy and search-friendly headlines and leads, vetting videos or photos and commentary and adding context. Style Guide: A guide to GV's stylistic standards. GV Story Checklist: A handy rundown of the elements that a story must have. News Writing Checklist: Another useful briefing of the important elements of news writing. Posting Guide: This wiki explains the technical aspects of writing Global Voices stories on WordPress. It goes into details about text formatting and how to add videos, photos, and social media quotes with copyright and attribution information, along with categories and excerpts to our stories. Global Voices Translation Guide: This wiki welcomes new translators with information to get them familiar with the GV way and offers technical advice on using WordPress to create translations, localizing content, translating non-English posts, and other formatting considerations. Edit Request Form: If an author or translator spots an error in a post or would like to make changes to their posts after publishing, you should fill out this form.